5 assorted icing impression mats. Complete instructions included. These icing impression mats measure 7 5/8" x 5 5/8" x 1/8" and this assortment contains 1 basketweave, 1 clapboard, 1 wood grain, 1 brick and 1 cobblestone mat. 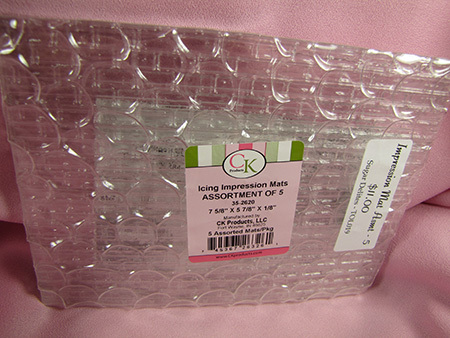 These icing impression mats are wonderful for adding texture to your Fondant or Buttercream cakes.